"We finally have a little glimmer of hope and even that is tremendous for us." 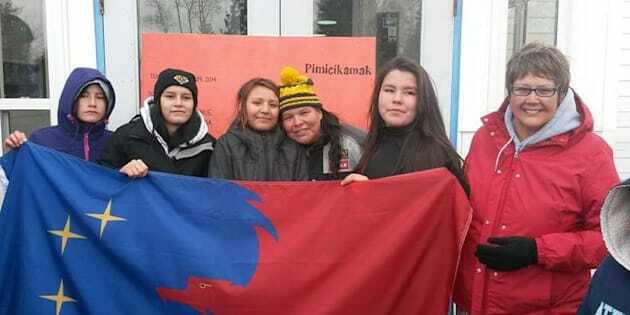 Noretta Miswaggon, third from right, and Pimicikamak Chief Cathy Merrick, far right, hold a Pimicikamak flag with teenagers Cherish Blacksmith, Theodra Thomas, Athena Gamblin and Bethany Ross, at Jenpeg Generating Station in northern Manitoba in 2014. The yard of Manitoba's Jenpeg dam was teeming with people. The RCMP had shown up. Pimicikamak Chief Cathy Merrick was there, pleading with people to stay calm. A few men were getting angry, Cree teacher Noretta Miswaggon recalls. They were shaking the doors of Jenpeg Generating Station, trying to get inside. "The chief kept coming to say, 'Please take it easy. We don't need any violence. We don't need the RCMP arresting people,'" Miswaggon told HuffPost Canada in an interview. "Then some kids started shaking the doors. And I don't know what happened, but the door came open." What followed was a six-week occupation of Jenpeg Generating Station, the culmination of 35 years of distrust, disagreement and environmental destruction. Hydro workers were evicted from their residences, with a few allowed to stay at operate the dam. Miswaggon and the other demonstrators didn't realize it at the time, but that day in 2014 would mark the beginning of the road to a completely new relationship with Manitoba Hydro, the crown corporation that built Jenpeg. Pimicikamak is a Cree nation that joined Canada in 1875, and is situated more than 500 kilometres north of Winnipeg. The Cree word Pimicikamak describes "where a lake lies across the river, the land surrounding that place, the people that has inhabited that land since time immemorial, the nation comprised of that people." People there say that Manitoba Hydro built a dam on their territory without consent in the 1970s, destroying the land and the people's way of life. "It's not possible to capture in words the damage done," Merrick said in 2015. Miswaggon is a Cree teacher and communications officer for Pimicikamak Okimawin, the nation's self-government. She stresses that harm done to the land is done to the people, too. "When Hydro built the dam, it severed our connection to the land," Miswaggon said, pausing to hold back tears. "It's hard to speak about ... Our poor kids, they don't realize what they've lost." Four Cree teenage girls from Pimicikamak, Cherish Blacksmith, Theodra Thomas, Athena Gamblin and Bethany Ross, managed to open the door to Jenpeg Generating Station in 2014, kicking off a six-week occupation. It was four teenage girls who pried the door to Jenpeg open that day. The youngest was only 12 years old at the time, Miswaggon said. Their bravery set into motion a series of events that has transformed Pimicikamak's relationship with Manitoba Hydro, and may eventually inspire renewed relationships between First Nations and other Crown corporations across Canada. The 2014 occupation was "an existential crisis for Manitoba Hydro," lawyer Colin Gillespie told HuffPost Canada. Gillespie's recent book, Portrait of a People: A Study in Survival, outlines the territory's history. He's had a relationship with Pimicikamak people since 1975, and estimates he's launched about 100 lawsuits against Manitoba Hydro, the Manitoba government and the government of Canada on their behalf. "Pimicikamak knows that anytime they want, they can kick Hydro out. And Hydro knows that they know. That changed everything," Gillespie said. Colin Gillespie is a scientist and lawyer based in Winnipeg. His recent book, Portrait of a People: A Study in Survival, outlines the history of Pimicikamak and its relationship with Manitoba Hydro. Bruce Owen, a media relations officer for Manitoba Hydro, said the 2014 occupation started a new conversation. "It brought us, and also the provincial government, into the community for an apology," he told HuffPost Canada in an interview. "And it also brought us to the table ... so we could begin to address the community's concerns. "Obviously, it's not good for either side for this to occur," he said. "There has to be a new way to talk." The occupation prompted Manitoba Hydro to agree to new negotiations, and got then-premier Greg Selinger to personally deliver an apology to Pimicikamak. "It really got their attention," Miswaggon said of Selinger and his team. "The way our people greeted them was also a sight. "When they got out of the vehicle that they came in, the people made a path with their backs turned to them, all the way to the teepee. When the meeting was over, they made that same path to the vehicle, facing them, greeting them, thanking them for coming. That was something I'd never seen before." After this, representatives from Manitoba Hydro and Pimicikamak began to meet regularly. In 2017, after three years of back and forth, Manitoba Hydro agreed to try a different approach. The utility now provides grants to fund community programs that Pimicikamak designs. The first projects paid for by this program began last summer, Pimicikamak Okimawin said in a press release announcing the "new start." "Pimicikamak upgraded the community's softball facilities with ground improvements, lights and fencing," the press release said. "Other programs include wellness initiatives, mental health programming, supporting Treaty Days, women's programming and community clean up." The first grant was a "giant leap for this relationship between the two parties," David Muswaggon told HuffPost Canada. He sits on the executive council of Pimicikamak Okimawin and is responsible for Pimicikamak's relationship with Manitoba Hydro. David Muswaggon is a member of Pimicikamak Okimawin's executive council. He's the official responsible for Pimicikamak's relationship with Manitoba Hydro. Manitoba Hydro has agreed to fund programs this way for a calendar year, which began in May 2017. Whether the grants continue or not will be a joint decision. "As we go on, the hope is for longer-term arrangements to be formulated," Owen said. "It's not only up to us what the results are ... It's not up to Manitoba Hydro. We're working with the community. Their input is just as valuable as ours, if not more." Before 2014, when Pimicikamak got something from Manitoba Hydro or the government, "we always had to give something up, or owe, or it was a loan," communications officer Miswaggon said. "Now, after 2014, Manitoba Hydro gave Pimicikamak Okimawin an initial amount of $1.5 million in May , and then we got another $6 million in July ... We finally have a little glimmer of hope and even that is tremendous for us," she said. One of the new programs funded by Manitoba Hydro, Ininiwi Pimapisiwin, strives to re-connect people to the land. This connection, which Muswaggon said was broken by Hydro's operations, is essential to Pimicikamak's nationhood. "If you go back in time, my people were a healthy people and a wealthy people full of wealth of natural resource and they were spiritually connected to the land," he said. "They governed the land and they were people from that. The water was healthy, the animals, the fish were healthy." All that changed when Manitoba Hydro showed up, he said. According to Portrait of a People, hydroelectric operations first began on Pimicikamak territory in the 1960s. In 1979, Manitoba Hydro completed the $310-million Jenpeg Generating Station where Nelson River flows into Cross Lake. The development washed away entire islands, Gillespie wrote, including historic sites and burial grounds. In 1977, Gillespie helped negotiate a treaty called the Northern Flood Agreement (NFA). In the agreement, Manitoba Hydro said that it would minimize damage done by fluctuating water levels, and would consider building a control structure at Cross Lake to "restore, to the extent practical, the natural pattern of seasonal fluctuation in lake levels." Two years later, water levels fluctuated by nine feet, causing both a record-breaking flood and a record-breaking drought in a matter of months, Gillespie said. Gillespie estimates at least 10 deaths have been connected to Manitoba Hydro's project. One man was out checking his trap lines when he fell through the ice and drowned, Gillespie said. The ice used to be about 10 inches thick in that area, but the dam caused warm water to flow upstream under the ice, drastically reducing its thickness. Another man was out in a boat when he hit a submerged log and died. Gillespie said Manitoba Hydro has paid multiple families legal settlements of about $50,000 for these fatal accidents. Many families are now too scared to teach their children how to hunt and trap as they used to. This map shows Manitoba Hydro's major operations. The utility says the Jenpeg dam, located where Nelson River flows into Cross Lake, is an indispensable part of its system. "What Manitoba Hydro did in the 1970s was they came and monetized our natural source of energy and they took control of all our resources and our waterways. To make money on it," Muswaggon said. "And it disconnected our people's spirit from the land ... And in exchange for what they've done they created this document called the Northern Flood Agreement, where they promised to do many things for the people." In the agreement, Manitoba Hydro promised to pay for the construction of new beaches, to protect or relocate houses vulnerable to damage, and to provide new recreation facilities. It also agreed to clean up any debris created by the project. Hydro said it would employ as many Pimicikamak people as possible at Jenpeg, and provide on-the-job training to "any able and willing resident." Asked if Manitoba Hydro has fulfilled these promises, Owen said there is no denying that the hydroelectric projects had impacts and they will continue to work with the community. Muswaggon believes Manitoba Hydro has completely failed to live up to its obligations under the NFA. "Many of my people have died without receiving the benefits they were promised," Muswaggon said. Anger at Manitoba Hydro and the provincial government, another signatory of the NFA, swelled for decades. In 1997, Miswaggon was hired by the local band council to teach other residents about a proposal called the Comprehensive Implementation Agreement (CIA). It would have relieved Manitoba Hydro of commitments made in the NFA in exchange for a cash payment. The plan was wildly unpopular, she said. People kicked her out of their houses for suggesting they settle. The CIA was defeated at council. In 1998, there was a partial barricade to stop Manitoba Hydro from bringing its transformers onto reserve land. "That was the first of a series of clashes between Manitoba Hydro and Pimicikamak people," said Muswaggon. He emphasized that Pimicikamak people stood up for their rights long before the 2014 occupation of Jenpeg. In 2007, Pimicikamak sent a "Notice of Indigenous Power" to Manitoba Hydro, the Government of Manitoba and the Government of Canada. "Enough is enough," it said. "The Hydro Project has turned the waters — the lifeline of Mother Earth and our home — into a death trap." Hundreds marched to the Jenpeg dam as a show of power. Gillespie and Muswaggon agree that there's no way to fully repair the damage done by Manitoba Hydro. "The beautiful white sand beaches are now mud banks and they're going to still be mud banks in 100 years," Gillespie said. But both are cautiously optimistic that Manitoba Hydro is serious about making a change. The utility is "putting action into reconciliation," said Muswaggon, the Pimicikamak Okimawin executive responsible for the relationship with Manitoba Hydro. "Hopefully, this new relationship will work ... I cannot go and tell my people that everything's going to be great tomorrow ... After 40 years of being trampled on, lied to, and cheated, it's going to take some time." He said a genuine relationship can't revolve around legal documents like the NFA. "We're walking away from these legal frameworks that are being drafted by lawyers, and we try to work on a relationship based on trust, transparency and accountability," Muswaggon said. Pimicikamak's ability to assert its power in this relationship could be monumental for Canada, Gillespie said. "[Hydro] needs to knock on the front door and ask if they can come in. [Pimicikamak] can say 'Yes, but take your boots off.' ... That has huge ramifications across the country. That's where we're headed." He said there's an ongoing discussion in the legal community about whether Indigenous consent is legally necessary. "The question isn't whether you need it, the question is whether you want it. Would it have value to you?" he said. "If it would have value, why don't you ask for it and find out what it would cost." Manitoba Hydro has finally recognized that its operations in Pimicikamak territory come at a price. How much it will pay is still to be seen.